The Niagara Parks Commission had prepared kits with pins and certificates for those who came to the planting of the memorial oak. Their participation was enthusiastic and much appreciated. Several dignitaries and committee members were present. Unfortunately, fewer then ten youth members of Scouting were in attendance. This is largely a result of the restructuring away from districts. The Area structure was unable to effectively get local Scouters on board with the project, creating an incalculable loss from a public relations standpoint. 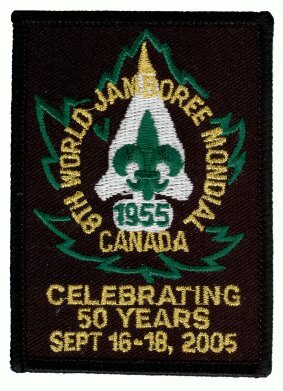 The sign advertising the Jamboree anniversary will be unveiled on Monday, August 15 at 10:00 at the corner of Queen Street and Mississauga Street in Niagara-on-the-Lake. The Lord Mayor will be present. Lou emphasized the importance of making the event colourful to attract the media. Bill C. will work with Lou on a media release. Ted and Tony will attend in uniform and will present an anniversary crest. All other committee members are invited to attend as well. Tony will contact the Niagara Area Commissioner about having a couple of youth members attend. Liam and Ted have confirmed that the committee will present a delegation to the Niagara-on-the-Lake city council on Monday, June 13. The committee will meet afterwards, either in the city hall or Joseph's Estate. Lou will arrange for a meeting place. Lou suggested visiting the Lord Mayor sometime before the meeting. Lou will arrange this meeting. The delegation should be about five minutes long. The purpose is to ask for a proclamation recognizing the event. Tony will speak on the committee's behalf. Everyone on the committee is encouraged to attend. Ted and Liam met with Clive Buist regarding the sign for the floral garden. Their sign painter will make a sign similar to the masthead on the web site. It will be 18" tall. The WJ'55 emblem is too detailed to be painted. a 12x12" decal or printed sign will have to be provided. The final arrangement need to be made by the middle of June. Bill met with the Niagara Parks Commission. They are working to restore Paradise Grove (which hosted the Timberlands sub-camp in 1955) into an oak savanna and tall grass prairie. They would like to plant a memorial oak as part of the celebration and use that as the kick-off to a program in which local Scouts will plant lupins to attract butterflies. Tony reports that Niagara Area Commissioner is interested. The Commission would also like to unveil an interpretive sign. Bill will work with the Commission to determine the best time for this, probably Saturday afternoon or Sunday morning. The Commission will run a story about this project and the Floral Clock planting. Bill C. mentioned that the Niagara Parks Commission has offered to plant a memorial oak. They would also like help planting flowers by the river. Tony will see if there is interest in this among the Niagara Falls Scouts. George has been in contact with the Event Management program at Niagara College. An intern has been offered to start the week of March 15. The committee discussed the difficulties of supervising the person and finding a place for them to work. It was suggested that the person could work out of Niagara Falls Scout House, though a phone line would be required. Due to these difficulties, it was decided to not pursue this for now. Ted has written to the Niagara Lion's Club and the Rotary Club of Niagara-on-the-Lake about the event and is awaiting replies. Ted has written to Holly Dowd regarding booking a delegation to present to the city council. These bookings are normally booked two months ahead. Ted will be in touch again later in the winter. Niagara College has an event planning program. George will contact their president to see if they are interested in getting involved.